Why Doesn't Cherry Candy Taste Like Real Cherries? We don’t expect the icy, red popsicle we enjoy on a hot summer’s day to taste the same as the plump, red fruit. Then why do they both share the name “cherry”? Most artificial flavors taste very little like their real fruit counterparts, but why? The answer has as much to do with history as it does with chemistry. For example, the grape flavoring of today’s hard candies tastes more like the Concord grapes that were popular at the turn of the century than the present-day table grapes that have become our go-to snack. Artificial flavor expert Nadia Berenstein joins us to discuss the origins of these fruity fakers. Nadia Berenstein is a history of science Ph.D. student at the University of Pennsylvania. She’s based in Brooklyn, NY. JOHN DANKOSKY: This is Science Friday. I’m John Dankosky, in for Ira. OK, I’m sure we’ve all had this experience before. You’re savoring a red, colored hard-candy, or maybe you’re indulging in an icy red popsicle on a hot summer day, and you taste that familiar, sweet flavor of artificial cherry. Of course, it doesn’t taste anything like real cherries, but why? If artificial cherry doesn’t share any resemblance to real cherries, or grape flavor doesn’t taste grape, then why do they share their namesake? And where in the world do these flavors come from? This hour, we’re going to bring you some of the real news about fake fruit flavors. And we want to hear some of your questions– 844-724-8255. That’s 844-SCITALK. You can also tweet us @scifri. Joining me to guide us on this fake fruit journey, is Nadia Berenstein. She just completed her PhD in the history of science from the University of Pennsylvania– focusing on the history of the synthetic flavor industry. So, welcome to Science Friday. Thanks for being here. NADIA BERENSTEIN: Hi, John. Glad to be here. JOHN DANKOSKY: I’m really glad that you’re here. And, boy, there’s so much to talk about. And we’ve got a taste test and everything. But let’s start with cherry flavor because cherry flavored candy, or cherry flavored popsicles– as we mentioned– really doesn’t taste anything like my favorite fruit. I love real cherries, but I know both flavors. Why do they taste so different? NADIA BERENSTEIN: So, I like to think of the cherry flavors, the artificial cherry flavors that we find in things like popsicles and cheaper hard-candies, as heritage or heirloom artificial flavors. JOHN DANKOSKY: Heirloom artificial flavors, I love it. NADIA BERENSTEIN: Because they give us a kind of glimpse into the flavor worlds of the past. So, where flavor chemists, nowadays, can certainly make or kind of formulate a much more naturalistic cherry flavor, the kind of sort of fake fruit flavors that we encounter in some of the most common frozen treats, and sugary candies, and cheap sodas, kind of take us back to the early days of synthetic flavor. JOHN DANKOSKY: When were those early days? NADIA BERENSTEIN: So, the synthetic flavor industry goes back to the middle of the 19th century, which a lot of people don’t realize. People think of artificial flavors as coming in after the war with processed foods and TV dinners, but they actually have a much longer history. JOHN DANKOSKY: So they go all the way back then. How were they analyzing fruit flavors? Or how were they developing, I’d say, a cherry flavor that they thought they might be able to pass off as cherry? NADIA BERENSTEIN: Well, that’s a good question. So, generally, in the early days of synthetic flavors, they weren’t doing the analysis of fruits. There’s many reasons for that, but the main one is that it’s incredibly difficult. The flavor chemicals in fruit, the chemicals in fruits that contribute to the thing that we perceive as flavor, are present in incredibly small quantities– parts per million sometimes parts per billion. And that chemical analytic work is very difficult to accomplish. So in the late 19th, early 20th century, generally, people who were working with flavors, who were making synthetic flavors, took available organic chemicals– and by organic I mean carbon containing chemicals. Not the kinds of chemicals you might buy at Whole Foods. And seized upon sensory resemblances between synthetic esters, for instance, and fruit flavors. JOHN DANKOSKY: OK, sensory resemblances, help me out here. What are we talking about? Are we talking about taste? Or are we talking about smell? What? NADIA BERENSTEIN: So, flavor is just multi-sensory. It’s a combination of taste, smell, sight, also tactile sensations inside our mouths, and even hearing. There’s a sensory scientist right now at Oxford, Charles Spence, who has done a lot of work on how the things that we hear– the crunch of a potato chip, or the music that’s playing on a restaurant stereo– actually influences the way that we perceive the flavor that we’re tasting and the food that we’re eating. JOHN DANKOSKY: Yeah. So, in these early days, where were these compounds coming from? What were they using to replicate, say, fake cherry flavor? NADIA BERENSTEIN: So, mainly they were using esters. So, esters were generally produced from either byproducts of alcohol distillation or sometimes chemicals that were produced as a byproducts of the coal industry. So there were a limited number of different chemicals that they were using. And they would recombine them in different ways to sort of imitate various fruit flavors. JOHN DANKOSKY: All right. So, we have a little taste test coming up here. Why don’t you tell us the story of the grape flavor? The grape flavor that everyone knows, it’s purple in color. But that’s– and you sort of can probably imagine it right now. But how did we get to a grape flavor? NADIA BERENSTEIN: OK, so, this is a kind of crazy story that I found hidden in a manuscript in an archive. But around 1910 or 1911, a man named [? Filbert ?] [? Heardy ?] was riding a streetcar in Indianapolis. And he smelled a whiff of perfume from a woman who was sitting next to him. And she smelled exactly, to him, like Concord grapes, like those dark purple grapes that sometimes you find at the grocery store or farmer’s markets. This was important to him because he was a maker of flavoring extracts for bottled sodas and for soda fountains. So he went through chemical catalogs and he found the chemical in question– methyl anthranilate, which was being sold under the name Synthetic Neroli– Orange Blossom Essence. So chemists in Germany and Austria had found this methyl anthranilate chemical in neroli, which is orange blossoms and is important perfume material at the time, and were selling it as this floral scent. But he seized upon this resemblance with Concord grapes and started using it in grape flavor. And there was a boom in great flavored sodas in the teens. JOHN DANKOSKY: Why was he the only one who noticed this? Didn’t anybody else, like, walk by that woman and say, she smells like grapes. NADIA BERENSTEIN: Well, that’s a great question. And I think the reason is that methyl anthranilate is a flavor compound in American grapes– in vitis labrusca grapes, which include Concord grapes. And it’s not found in European grapes– in vitis vinifera grapes. So the manufacturers of this synthetic compound in Germany and Europe wouldn’t have noticed the resemblance with grapes because they were eating a different kind of grape. JOHN DANKOSKY: Interesting. OK, so we have some Concord grapes here. We got the last few at the farmer’s market. And I’m gonna just taste one, very quickly, just to see. Oh, so this is interesting. I haven’t had a Concord grape in a long time. And I promise, people, I’m not going to chew on-air. It does have a little resemblance to that fake grape flavor. It feels a little bit like it’s coming from the skin of the grape more than what’s inside. So, I guess I’m wondering why I am able to taste so much of what the fake grape flavor is, but there’s still something that’s quite a bit different in there too. NADIA BERENSTEIN: –that you can sniff– courtesy of the Museum of Food and Drink. I borrowed some of the spares from their smell synthesizer. JOHN DANKOSKY: You don’t just carry it around with you? NADIA BERENSTEIN: No. I should, though, because apparently, it’s a very good bird repellent. JOHN DANKOSKY: Pass it over here so that– oh, OK.
JOHN DANKOSKY: So this is the smell of the fake grape flavor. NADIA BERENSTEIN: Right, and you should also detect at least a little bit of a resemblance with the Concord grape itself. I grew up eating mostly California grapes, which are the standard c-list red and white. And they don’t have this foxy flavor– I think is the technical term for it. JOHN DANKOSKY: What’s so interesting about it is that knowing that this is a chemical that you just passed to me from a jar across the table, as opposed to something that’s purple and I might want to put my mouth, I’m actually also picking up some more chemical smells and something that smells a little bit like a detergent in there. And that might have to do with my other senses too, right? I’m looking at it knowing that this has nothing to do with the grape whatsoever. NADIA BERENSTEIN: Right, yeah. Yeah, absolutely. JOHN DANKOSKY: Well, if you have questions about fake fruit flavors you can call us 844-724-8255. That’s 844-724-8255. We’re going to get some of your questions in just a moment. I guess one question is– so, you have these chemicals in the 1860s, how did they know you could actually eat them? That this was OK for people to consume. NADIA BERENSTEIN: Well, that’s a good question. At the time, the science of toxicology wasn’t as sophisticated as it would become in the 20th century. There were no standard protocols in the late 19th century for testing these things. In fact, Harvey Wiley, who was the commissioner of the Bureau of Chemistry, was one of the proponents of one of the pioneering food safety laws– the Pure Food and Drug Act in 1906. Famously did this self-experiment with him and a bunch of hale and hearty young men who called themselves The Poison Squad, who ate meals with escalating amounts of preservatives in them to prove their unwholesomeness. But, generally, flavor additives– the flavor molecules in flavor additives– are used in such small quantities that they tend to be considered toxicologically insignificant. Since the late ’50s and early ’60s, there has been a formal system in place for assessing the toxicity of these molecules. JOHN DANKOSKY: I think we can all be happy about that. Let’s go to Thomas, who’s calling from Barrington, Illinois, because I think he’s got one of the questions that I really have. It’s one of the burning questions I’ve been thinking about. Hi, Thomas, you’re on SciFri. THOMAS: Hi. I had a question about the fake banana flavoring. I heard a while ago, while reading, that in the 1950s there’s a strain of banana that the flavoring is now based off. But that banana supposedly went extinct. And I was wondering if that story is valid? Or if it’s just another rumor made up online? JOHN DANKOSKY: That’s what we– we’re trying to find out what fake news is about fake flavors here. Thanks, Thomas. Go ahead. What do you think? What can you tell us? NADIA BERENSTEIN: Hi, Thomas, that’s a great question. And that’s actually– you’re absolutely right about the change in the banana regime. Prior to the 1950s, the commercial banana variety that was widely available was known as the Gros Michel– Fat Mike, or Big Mike, for you French speakers. And banana cultivation is a monoculture, and in the ’50s it was sort of a combination of various kinds of fungal plagues that caused the Gros Michel to be replaced with a banana that we know now– Cavendish. So, Gros Michel did have more of this compound called isoamyl acetate, which we associate with fake banana flavor, than the Cavendish. It did taste, apparently, more candy like. It’s not extinct. You can still find them some places. 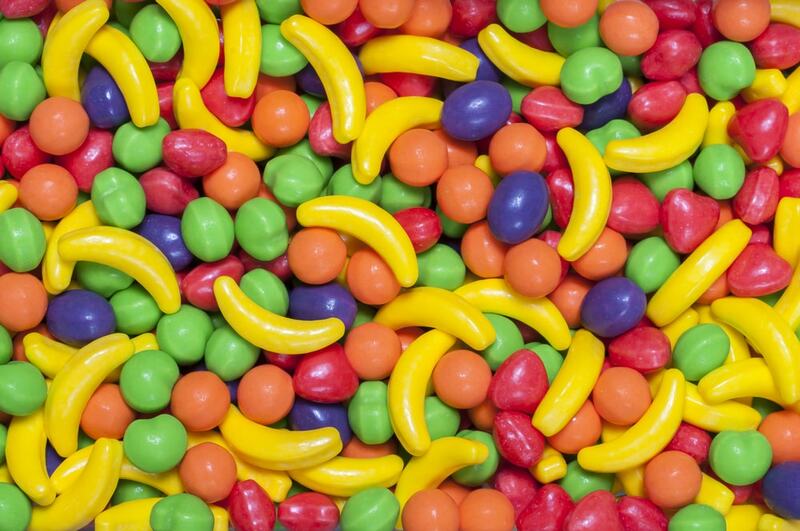 That flavor has, actually– I looked into this story, and one of the most astonishing things about that is that isoamyl acetate based banana flavors were being sold, and used, and were actually quite popular in the United States, at least 10 years before bananas were widely commercially available. So, you see banana flavor in the US in the 1860s, but bananas as a widely available commercial product, generally, are associated with 1876– the Philadelphia centennial. JOHN DANKOSKY: So, hold it. So, it’s probably likely that the first time anybody ever bit into a banana in the US, they thought, this doesn’t taste like a banana at all. I know exactly what it tastes like. It’s this other thing. NADIA BERENSTEIN: Well, people would have been eating synthetic banana flavored candies and confections before– many people– before they were likely to have tasted an actual banana. JOHN DANKOSKY: It’s kind of amazing. I’m John Dankosky. This is Science Friday from PRI, Public Radio International. And we’re talking to Nadia Bernstein as she just completed a PhD in the history of science from the University of Pennsylvania. And she focuses on the history of the synthetic flavor industry. We got a tweet from Tom who says, is it true that artificial cherry and artificial almond are the same? He says, we did an experiment in 8th grade that fooled us with coloring alone. NADIA BERENSTEIN: Huh, well that is– that’s very astute, actually. So, benzaldehyde, which is one of the compounds that is used in these heirloom cherry flavors, is the same compound that you find in essential oil of bitter almonds. And the reason for that, I think, is that in the late 19th century cherry flavor was more often associated with wild cherries and with cherry liqueurs, like maraschino liqueur, which had more of that pit flavor. You find the benzaldehyde molecule, actually, in cherry pits and stems. JOHN DANKOSKY: Interesting. OK, let’s go to another phone call. Here’s another question that we had. Greg is in Chicago. Let me see if I can get Greg’s call up here. Hi, Greg. Go ahead. You’re on Science Friday. GREG: Hi. Artificial raspberry flavor and artificial blue raspberry flavor don’t taste the same at all. I was wondering if you could expound a little bit on what the difference is between them are chemically and historically? When they came to be. NADIA BERENSTEIN: Yeah, that’s a great question. It’s a little bit difficult to answer because there are many kinds of artificial raspberry flavors or many varieties of them. Blue raspberry is an interesting story. I don’t fully– I haven’t completely confirmed this firsthand, but part of the reason for the emergence of blue raspberry into the world, was that one of the coloring compounds that was used to color raspberry flavored things– FD&C Red #2– was banned and made illegal in the 1970s. So, sometimes that color would have been mixed with that turquoise blue that we associate now with blue raspberry– FD&C Blue #1. So I think there’s a rumor that a company that had been making raspberry flavored icee’s, once they could no longer use the dark red, just started using the blue. JOHN DANKOSKY: But you hinted at this before. I mean, does it change the way we experience the flavor by looking at this thing that kind of looks like, I don’t know, windshield washer fluid? NADIA BERENSTEIN: Oh, definitely. Definitely. Our perception of flavor is multisensory. So, the color of it plays a big role in the way that our brain interprets the other kinds of sensory information that we get about what we’re eating. JOHN DANKOSKY: We’ve got to go. I just have to quickly ask you, what is your favorite fruit flavor? The fake ones, at least. NADIA BERENSTEIN: Oh, man, that’s a hard question. I think– I don’t know. I’m partial to fake grape. That’s how I got started on this research project, and it still brings back nostalgia. JOHN DANKOSKY: Well, I’ll hand you the rest these Concord grapes. You can eat them during the break. Nadia Bernstein just completed a PhD in the history of science from the University of Pennsylvania– focusing on the history of the synthetic flavor industry. Thanks for the taste and the smell test today. NADIA BERENSTEIN: Thank you, John.